FomieDM came up with the idea. basically a place to share crashes just for fun or for people to learn from. also a good way to find weaknesses in certain designs if they tend to break in one place a lot. I found the Simple Scout to be quite resilient, but weak in the nose. It took repair after repair, until the region around the power pod was pretty much all made of hot glue. The rest of it is a pretty durable design. Simple Scout ailerons are VERY responsive, even with expo. Lots of surface area. It can get you flipped over quick. The FT Spitfire fuselage is particularly weak at the wings, especially if you try to do the removable wing. Skip immediately to gluing if you want it to last. I was way out of my league when I built/flew this plane, and it didn't last long at all. CofG... I wasn't as educated for this plane, and exactly how important it is. The mini scout is a pretty strong plane, and took a couple of punches to the nose with very little damage. More altitude helps when you need to recover. But then it is farther away, and tougher to see. I had safer flights when I avoided compound movements, and instead separated them up into more "series" components. Example: bank the plane first with the ailerons, and then bump the elevator to horse the plane around a turn. Don't fly your plane such that it flies between you and the sun. You might get the top and bottom confused, and then you correct in the opposite direction. End result is violent de-winging of a plane you spent several hours painting and decorating. Sometimes cutting the throttle and letting it come down harder than desired is better than flying into the side of a house. This describes my Eflite P-47 maiden flight. Yeah I learned early that cutting throttle is the best option when you're a noob. On my P-51 maiden a few years ago I clipped a telephone line with the wing (I did not have enough throws, just like Ben's Valyarie) And I could have powered out of it but instead I let it fall and break the prop and crinkle the nose a bit. But that's better then having it go full throttle into the ground, or onto a roof. One thing immediately came to mind, this is the WORST I have ever felt about a plane. For Christmas I built my dad an ft Old speedster and he thrilled about it. He told me that I should give it a paint job and I learned a hard lesson about what spray paint will do to foam in large amount (destroy it). I ruined the plane and it really sucked but I learned a lesson about spray paint. My very first design - Caudron C460 race plane - a full size build at 44" wingspan with all the pretty covering and looking sharp. On the maiden flight of what would later become known as "Prototype 3" it was a little squirrely on launch, but I got it under control and made about 5 or 6 good circuits around the field doing some trimming. Feeling pretty good and decided to land her to make some changes on the control throws. Keep in mind this is a low wing racer with a fairly small wing and a thin airfoil designed for high speed. So I slow down and make the base leg turn for the landing approach. Mistake 1 - it just happens there is a cross wind that puts the base leg into a tail wind. Mistake 2 (the fatal one) - like a ^%@!%# noob, I made the turn bank and yank style with the right stick, pitching over with the ailerons and pulling back on the elevator. So with the combination of these elements, what do you think is going to happen? You guessed it! What happened is it dropped altitude with all the glide ratio of a ring full of keys. And without enough control surface authority on the ailerons to roll it back level because it was falling sideways in what some people like to call a "tip stall" but is really just "stupid pilot banked over without enough airspeed to keep lifting forces more than gravity". And that's when I knew I needed to make Prototype 4 (which I crashed at Flite Fest after the air races, but that's a different story) and learn how to love the rudder. My third build was 3dLabPrint's P-51. Spent 50 hours printing it, an afternoon putting it all together, take it to the field and launch it. Flies straight up 30-40 ft, hammer-heads, and loses control. Smashes into pavement turning the craft to shards of plastic. Crushes the windings on the motor, breaks the ESC and battery. On the maiden, make sure you aren't tail-heavy. Wasn't as much of a crash per say. Opened the rear hatch on our Dodge only to find that a box of books had fallen over on my Tundra. She had three flights. Destroyed the horizontal tail section. Lesson learned? Don't let my wife drive with planes in the back of the car. The Tundra is now back in the air and flies great. I never ever let my wife transport my aircraft anymore. sounds like you have had a lot of rough experiences with unfortunate events! thank you for the advice though. i am building the simple scout so the aileron tip is very helpful. i also need to learn to fly higher. when i maidened my ft flyer i just flew less than 50 feet off the ground at all times. usually less than 15 or 20 feet. i hope i dont do that with my first paint job... hey speaking of painting, have you tried painting over minwax before? any tips for putting on minwax or spray painting over it? wow! that is quite the tale! i like the expression "with all the glide ratio of a ring full of keys" haha! WOW!!!! now THATS A CRASH STORY!!!! yikes!!! ok so now i am going to tell about the first time i tried to get into this hobby. it was about 5 or 6 years ago. i was like 10 years old. i saw these people in youtube videos flying planes. it looked fun. this was about the first time i watched a ft video. i had no clue how the controls worked or anything. saved up and bought a $100 pusher trainer foam plane at the local hobby shop with some birthday money. i couldn't wait to fly it! on the first not so windy day (so like 8mph winds) i took it to my grandparents house because they have a field. i couldn't get it to fly. finally i get it in the air with an underhand toss and it just goes up and up and it all happened so fast i don't remember if i actually flew it for a second or not but it went up and up and the wind took it over the trees and far away until it was just a tiny dot in the sky then disappeared. i was traumatized. i got a crawler for christmas a few years later. that cant fly away. i watched ground vehicle videos then halfway through 2016 i started watching plane videos again. i watched a lot of flitetest. started watching regularly around the time of the start of the vlog. february vacation of 2017 i build the airframe part of the ft flyer while recovering from having my wisdom teeth out. april vacation i build the sparrow as a chuck glider and have tons of fun with that. for my birthday i get money for buying power pack b. i then get the wrong batteries from ft and send them back and they dont have the right ones in stock. get the right ones from hk. now for the maiden. here is the video if you want to watch it. i would appreciate some tips on what i did wrong. well. clamest day i had. 10mph winds. first time flying. luckily i have practiced on a simulator so i feel like a pro. lol. i have a bunch of friends around plus my mom who you will hear throughout the video. first clip: i takeoff from the ground. goes well. i fly a little bit. come land ON THE PAVEMENT. wheel falls off. broken prop. next clip: i try to take off with the unattached wheel which falls off. third clip: notice i still am using the broken prop which is way off balance because half of each blade is shattered off because it hit pavement. hand launch. severe lack of power. i fly a bit then try to land ON THE GRASS THIS TIME which ends in my stalling just above the ground and landing nose first and flipping over. fourth clip: new prop. this is now the 10x4.5 instead of the 9x4.5 i had before. much more thrust. i decide to try a loop or something. apparently the, lets see, march, april, may, june, july, august, september, 7 month old low temp hot glue didnt want to hold. wings fold. boom into ground. bent the new prop. i bend it back a bit. next clip: prop sounds a bit funny bc its bent back and off balance. i also have a stick taped between the wings to keep them down. almost strikes the ground on takeoff. going fine then i guess i didnt have enough elevator authority and when i took a steep turn into downwind i went full throttle trying to recover- straight into the ground. now the prop is REALLY bent. sixth and final clip: i think this is my longest flight. i crash because i was flying downwind towards myself and turn towards the field and away from my body and again, not enough levator or maybe too much rudder and bam into the ground. if you look closely in the slomo you can see the power pod rid off and the wing bend and yeah it was a mess. conclusion: i flew five times. i need to not land as much. i need to fly higher. i need to not go so fast into corners. i need to not do loops in a 3ch trainer. i need to remember that there is less lift on downwind. please let me know if there is anything else. 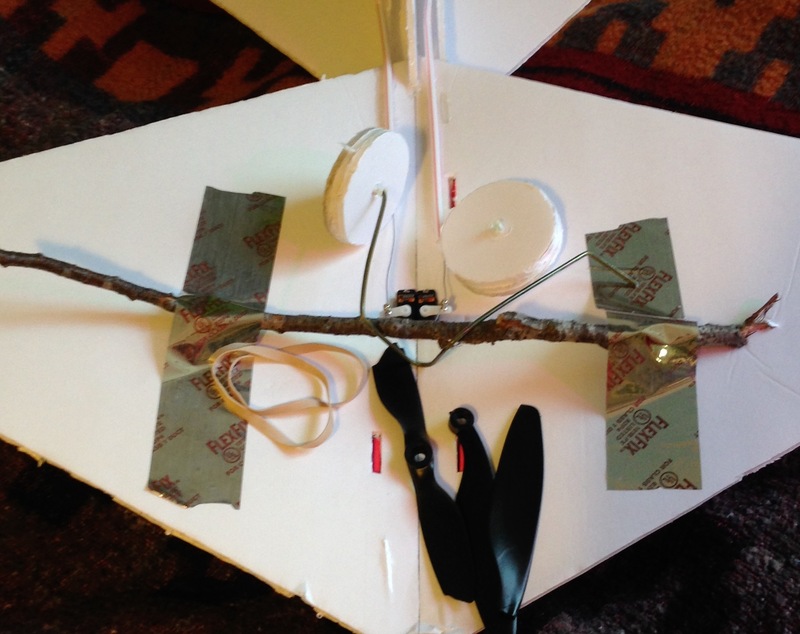 i have since reglued the wings and made adjustments to the elevator and glued a bbq skewer between the wings for strength. for anyone building the ft flyer. i recommend a support between wings and dont do loops. I learned exactly why you don't pull out of inverted. I proceeded to fold my Storch's wing in half at an altitude of 200 feet, then watched in disappointment as it spiralled into the ground... near the end of the jet turbine runway. I had fun basically dodging jets to retrieve it. The nose was completely bannana-ed, and the wing was totalled, but the tail was fine, so I might rebuild it. I now build my airplanes with a heavily reinforced wing spar. Definitely use expo on the ailerons, and reduce the rate of the aileron servos either in the TX or by moving the pushrod to the innermost hole, or both. It flies pretty decent in 3 channel without touching the ailerons. Just make sure to get it just a touch nose heavy, too. Tail heavy just keeps pointing you up, and you will eventually stall it. I just did my first flight with an fpv camera on board using a brand new scout build. It made a great steady slow platform. When heading into the wind, it practically hovered. hmm. i have a little aio camera so i might try that once i have flown it a couple times. thanks. maybe i will just make it 3ch for now. maybe later cut out the ailerons for 4ch. I have a mini scout that I have used for FPV, it is a ton of fun, I'd definitely fly it LOS first but yeah FPV is awesome! yeah i should probably get a bit better at flying first. also i might want to get a 200mw camera bc 25mw doesn't go that far. even on a clear day. Yeah mine works great for my baseball field at the end of my street, I want a 200mw one though for when I need more than a baseball fields worth of range. But I NEED to upgrade from my 007's, they are great goggles, but they don't have the features I need, like a DVR or diversity. Don't fly your plane such that it flies between you and the sun.